After a lifetime spent gardening in California, one thing I’ve learned is there’s drought tolerant, and then there’s drought tolerant. Many plants that claim to be low-water might do okay for the first year or two, but soon ‘cry uncle’ when blasted with year after year of unrelenting drought. As a designer, it’s a constant challenge to find beautiful and unusual plants that don’t just eek along in these difficult conditions but to discover those that actually thrive. And that’s the key word here, having a garden that truly thrives. As we’re coming to an end of our 5th year of unrelenting drought, I thought it would be helpful to share my seasonal favorites that do really well in my garden, as well as those of my clients. Throughout the next year, I’ll be writing a lot about my seasonal favorites that thrive in the toughest of times. Most of the plants I’ll feature are from my garden and those of my clients, requiring water once or twice a week during the hottest summer months. This show-stopping beauty has been in my garden for a few years now, and never fails to steal the show with its 10-inch spires of rich purple blooms. It quickly grows to 5×5, but can be kept smaller with late winter pruning. In the spring and summer, the well-behaved 5×5 mound quietly sits in my garden waiting for its turn on the stage, but once the peak of summer begins to wane – look out! Be prepared for weeks and weeks of oversized purple blooms that delight your hummingbirds. I purchased mine at Annie’s Annuals, and while they suggest average water, mine has flourished with the bare minimum (twice a week.) Its oversized leaves would make you think it’d wilt in 90-degree temps, but not once did I see it show signs of stress – a trooper, for sure. Also called ‘Turk’s Cap’ (for obvious reasons) this giant, native 8’x8′ shrub has been in my garden for years and years, happily growing in part shade with zero coddling from me. In fact, I recently had to cut down a dying birch tree that was the source of its shade, and did it phase this plant one bit? Nope. In fact, while walking my dog, I spotted another happy and healthy Turk’s Cap growing in the full, blazing sun, neglected on the side of someone’s garden, happy as can be. While it dies back in the winter, it quickly grows to 8-feet or more in a single season, supplying rich nectar to every hummingbird in the neighborhood. Two thumbs up from me! If your garden needs a hit of shockingly bright color to carry it through the fall, zauschneria is for you. Also called ‘California fuchsia’ or epilobium canum (just to make things more confusing) this plant thrives in brutal conditions – blazing hot sun with very little water. The foliage is typically a silvery gray, which beautifully complements the bright colors, but there are a few varieties that have a greener tinge (such as ‘Hurricane Point’) if gray isn’t your thing. For an excellent article about the many different zauschnerias available, and different colors (did you know they come in white or light pink?) take a look here. Each spring I’m fortunate to receive new plants sent to me by various growers, for the purpose of trialing them in my own and client gardens. These plants often have an emphasis on low-water and low-maintenance, and while it’s exciting, I always say a silent Hail Mary once I plant them in the ground, knowing full well just how difficult our region is for these tender babies. After all, a Midwest grower’s definition of low-water (with their summer rain) is very different than California’s version of low-water! 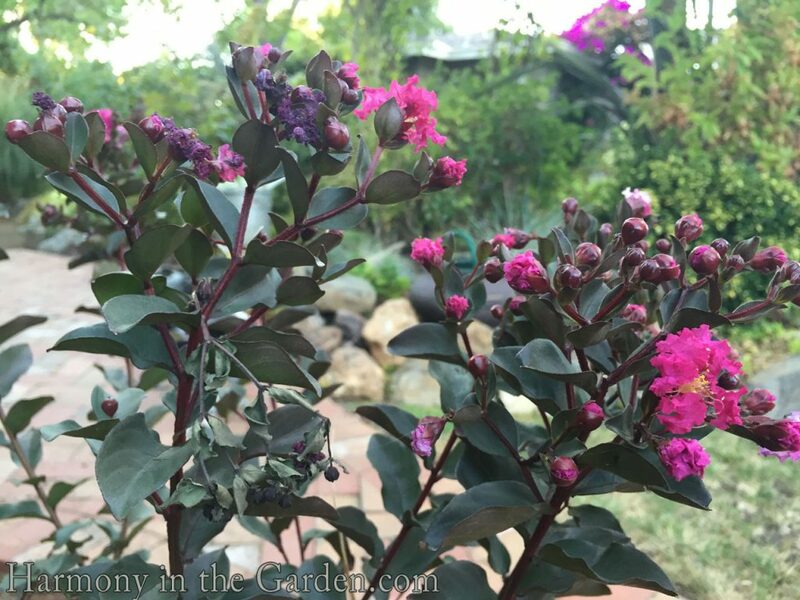 One of my favorites that has thrived in my garden for the past two years is the dwarf ‘Mystic Magenta’ crape myrtle, sent to me by Black Diamond Blooms. I’m always a little skeptical with new varieties that tout dark, burgundy leaves as the foliage usually end up reverting to a dark olive green in the summer’s heat. But not this one – the new foliage emerges burgundy, and stays burgundy throughout the entire summer. And not only that, its small size (10’x8′) makes it perfect for containers. Growing at the base of this container is a new, dwarf variety of artemesia from Proven Winners, called ‘Silver Cascade.’ I adore its tidy dimensions of just 4″ x 12″, making it my new go-to tough, little plant for my pots. For those of you who like coral colors, ‘Ember’s Wish’ salvia is a must. I first saw it a couple of years ago in a garden (photo above, paired with a ‘Field of Dreams’ ornamental corn) and fell in love with the color echoes it offered. And while the corn is no longer in this garden, each year as I pass by the salvia looks better and better. Recently, I planted ‘Ember’s Wish’ in the garden I designed for Sunset this past spring, and we were all floored at how quickly it grew to 4’x4′, and how it has consistently been covered with a zillion blooms. I know I’ve written about this variety before, but I can’t recommend it enough for reliably returning each fall, just when you think your garden is winding down the for season. With its chartreuse foliage and delicate, fluorescent red tubular flowers, Pineapple Sage is one of my favorite fall additions. Plus, the flowers and foliage are edible, with a deliciously sweet scent and flavor. My daughter discovered this plant when she was just a toddler learning to walk and would keep its normal 4’x4′ dimensions pruned to her 2′ height as she made a bee-line over to it each day to chow it down. Even to this day, when she comes home from college for Thanksgiving break, I’ll find her over by my plant snacking away with a handful of leaves. Oh, and for a really great tutorial video showing how to prune salvias, take a peek at here, at Flowers-by-the-Sea. I’m always surprised at how few West Coast gardeners utilize this workhorse of a plant. I’ve had mine growing in my full-sun front garden for years now and am always so happy to see it’s early fall cheery, delicate blooms that appear to wave in the wind. ‘Fireworks’ is a smaller variety, topping out at around 3-feet, making it perfect for smaller garden beds. Each year it grows into a larger and larger mass, so dividing it is important to make sure it doesn’t slowly take over your garden (I divide mine every few years, giving clumps to my friends and clients to enjoy.) I especially love the photo on the right, where the gardener combined it with Shasta daisies, creating subtle yellow color echoes. Bulbine is a mainstay of my garden and garden designs, able to happily live in a full-sun or a lightly shaded part of the garden. Rare is the plant that can do that, all the while blooming like mad off and on throughout the entire year. When not in bloom, the tidy 2’x3′ mound has lush green succulent-like fleshy, tubular leaves that are surprisingly cold-tolerant (hardy to 20-degrees.) Slowly spreading by rhizomes, bulbine forms a beautiful, thick stand along the front of the garden bed. I’ve even heard that it’s similar to aloe vera in that the juice from the crushed leaves is good for minor burns and rashes. I’ll have to remember that next time I scratch myself while working in the garden. 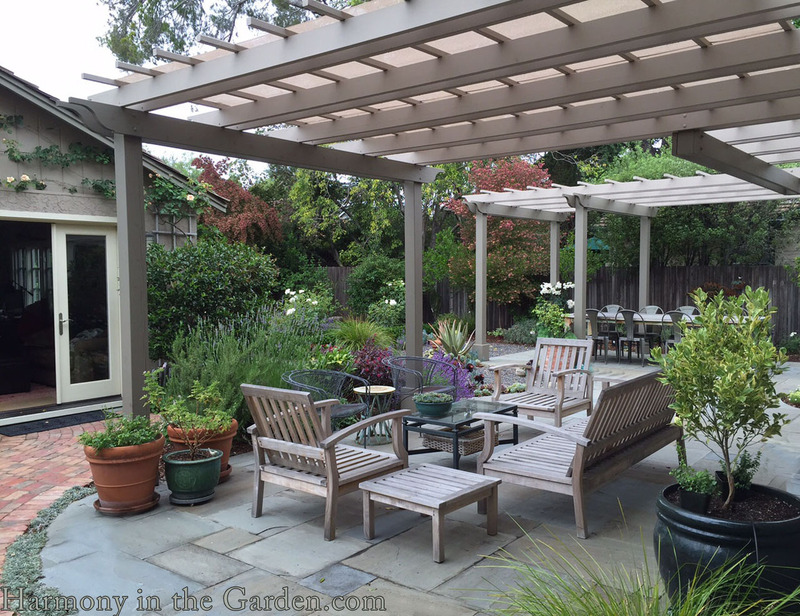 In just a few weeks, I’ll be writing the next installment in this drought-tolerant series and will focus on year-round shrubs that hold your garden together, no matter the season. In the meantime, if you have a favorite bullet-proof, fall-blooming, drought-resistant plant to share with us, please leave a comment below. I know we’d all love to know about it! Oh, I also wanted to let you know that I recently had the honor being interviewed by Theresa Loe, producer of Growing a Greener World and her own wildly popular website, Living Homegrown. The topic is based off my latest book, Refresh Your Garden with Color, Texture & Form, and if you’d like to listen and learn how to refresh your fall garden please click here. This may be more appropriate for the discussion on drought tolerant shrubs, but it’s hard to beat Hydrangea quercifolia (Oak Leaf Hydrangea). Mine is a well established shrub, that gets full sun for a good portion of the afternoon here in the S.F. Bay area, and it just does not wilt! It is a stunning foliage plant, has beautiful spires of creamy white flowers in the Spring and even here in our mild winter climate, has beautiful fall color. No pests, easy to prune – wonderful plant!! Hi Ronnie – I’m so glad to meet another Oakleaf Hydrangea fan. And I totally agree – they’re so much more drought-tolerant than people think. Super tough and gorgeous shrub all the way around. Thanks for sharing with everyone! A favorite of mine is Physostegia Virginiana , I think mine is Rosy Spire. I water sparingly twice a week, and needs to be divided every few years. A good cut flower as well. Thanks, Susan! I’ve only seen this plant in magazines but always admire the symmetry of the flowers. Maybe I’ll give it a try in a container next year. Omgosh..thank you! I have been looking for a large leaf plant for my garden that can handle the sun. All I have is Brugmansia and we know they only are perfect for absolutely about 10…maybe five…minutes! I will get that gorgeous Plectranthus! Thanks Catherine, what a touching story – thanks for sharing. Hey Rebecca… One of the plants we have in common that is both drought resistant and a workhorse is in the Zausneria family, Orange Carpet. She a bit of a thug when she is happy, but who cares??? She’s orange, nothing seems to want to chew on her and she’s a flashy kind of girl! I love a tough, flashy gal who no one wants to chew on – thanks for the laugh, Sheila. So nice to hear from you! Such gorgeous plants and all with the bonus of colorful blooms! Can’t wait to try some of these. Thank you so much Rebecca for your timely suggestions for us drought weary Californians.